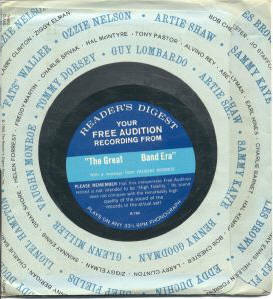 Vaughn Monroe was the narrator on this promotional disc to pitch a record collection from Reader's Digest called "The Great Band Era". It featured "120 original recordings by 37 of America's greatest bandleaders and their top vocalists", all enhanced by RCA Victor's recording engineers to "remove all the irritating noise and scratchiness that was always present on the original records, even when they were brand new." The 10 record set features some of Vaughn's own hits, but the best part is this free audition recording. Listen to this record on YouTube.